The scale of the construction work involved in the creation of the system of dams, reservoirs and buildings in the Elan and Claerwen valleys was so big that a new 'village' had to be built for the workers and their families. The new village was built on the far bank of the River Elan, below the site of the first dam to be built at Caban-coch. This is the first dam to be reached on the road from Rhayader. Most of the unskilled labourers or 'navvies' who worked on the dams moved around the country from job to job. This meant that the people living in the workers village were always coming and going. The running of the village community was strictly controlled by the Birmingham Committee, and most of the rules were enforced by the Chief Engineer, George Yourdi. 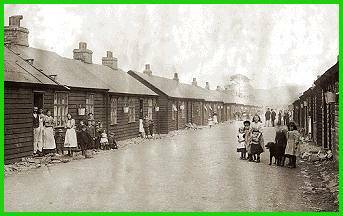 Because of the numbers of strangers who turned up looking for work, new arrivals were kept out of the village until they had been thoroughly checked by a doctor to prevent infectious diseases from being brought in to the crowded community. They were also forced to have a bath before crossing the bridge to the village !